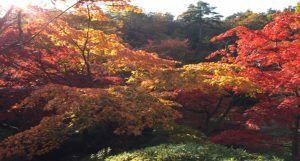 Koyo, is the autumn season in Japan – where the leaves start to lose their green and people across the nation flock to enjoy the last few temperate days and sights of breathtaking foliage before winter sets in. Spending a day indulging in the array of colors brought on by the changing leaves is a pastime as old as the spring counterpart of viewing cherry blossoms. Join us, won’t you, as we capture the best of this region, a brand-new itinerary for 2019. Besides all the best of Tokyo, we have included visits to Takasaki, home to the #1 hot springs in Japan, Kusatsu Onsen and Matsumoto, famous for having one of Japan’s most beautiful castles. There’s an onsen stay, 2 hands-on experiences, apple picking and daruma painting, Jigokudani Monkey Park, bullet train ride and a complete free day in Tokyo! From the incredible countryside fall vistas to some of Tokyo’s best shopping streets, this tour is one you won’t want to miss. In flight meals, breakfast daily at your hotel, 4 lunches & 1 dinner. Final payment due by September 13th, 2019. Package is non-refundable after this date. ” Land tour cost is based on current currency conversion rates. Should there be any major changes that would affect the cost, we will advise and you will have the option to cancel with full refund or pay the difference. 11/18/19 – Depart Honolulu on Hawaiian Airlines flight 821 at 1:40 pm and arrives Narita at 6:00 pm, 11/19. 11/25/19 – Depart Narita on Hawaiian Airlines flight 822 at 9:00 pm and arrives in Honolulu at 9:10 am (same day).